Below is our suggestions for the traditional starter, main and dessert menu to enjoy on St Andrews Day on the 30th November as we celebrate Scotland's Saint. There are several choices of starters for a St Andrews Night menu, but we at Scottish Recipes favour the traditional fish soup Cullen Skink though you can equally make Tattie Soup for those who do not like haddock. 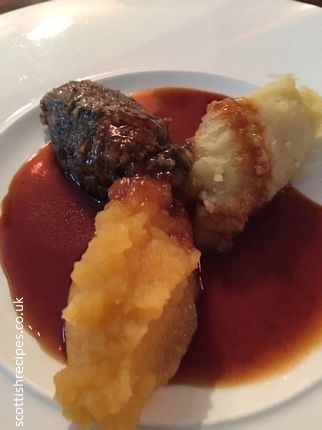 There can only be one choice for the main to celebrate our Saint and that is Haggis which we'd suggest serving with mashed tatties (potatoes) and neeps (turnip), as seen in the photo above. The links above take you directly to easy recipes for a St Andrews Day menu and we do recommend a fine malt whisky or two! See the Scottish Saltire St Andrews National Flag Scotland page.